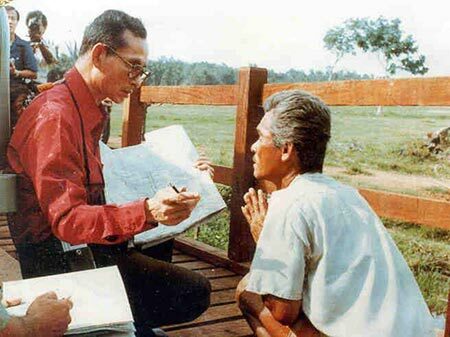 As the late King Bhumibol Adulydej’s funeral approaches, Kasma and I have been revisiting his life and feeling anew deep sorrow at the passing of this incredible man. I would have expected time (it’s 11 months since his death) to dull the grief somewhat: that has not been the case. A friend of Kasma’s recently wondered what the fuss was about, why virtually an entire nation could revere one person so much. 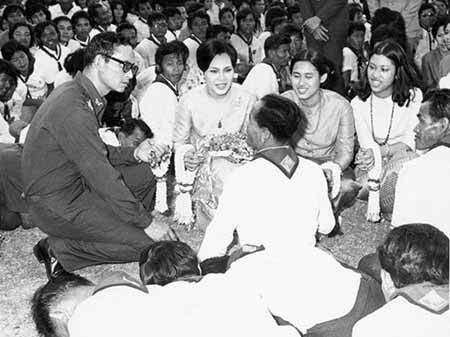 She wanted to better understand why Kasma is going to Thailand this year to take part in the ceremonies honoring the King. Kasma put together this list for her friend. We invite you to follow some of the links and learn about this extraordinary being. I think I’ve more than overwhelmed you with information about my beloved King. See what a short nine-word question can get you? 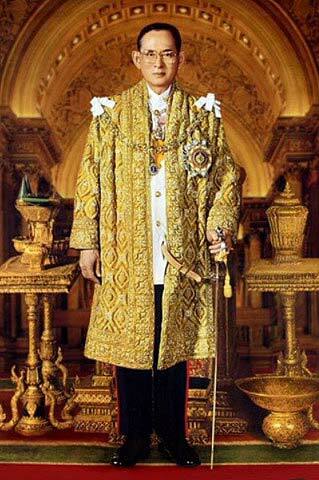 The King has been the focus of my life this year and it’s been very hard to accept that the hero of my life has left. 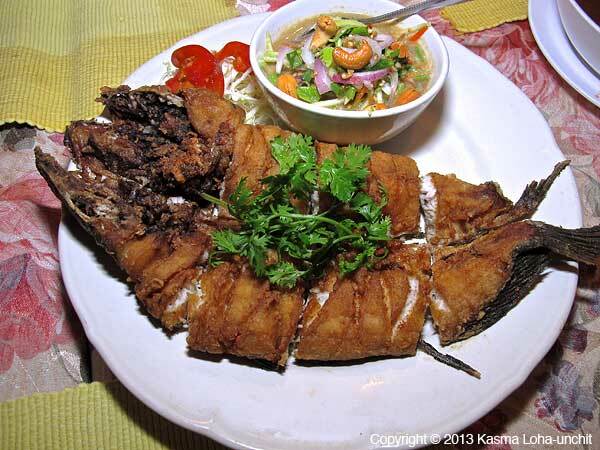 One of the favorite ways to prepare fish in Thailand is to fry it until it is thoroughly crispy – head, tail, fins and all – but not greasy. 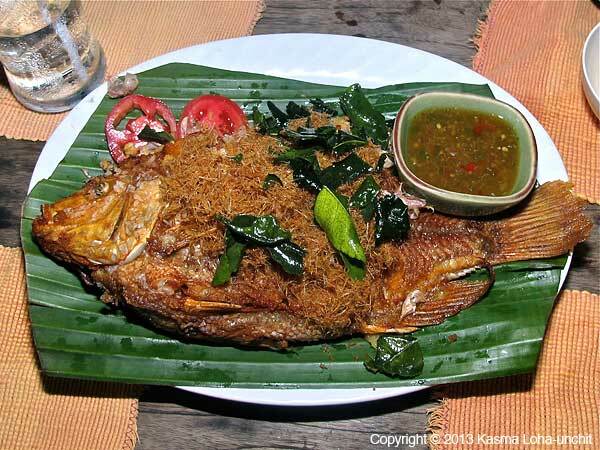 To get it this way, the fish is fried unskinned in plenty of hot oil for longer than what is normally recommended in western cooking, so that it is not just cooked through and still moist with juices inside the flesh, but until it is completely dried through. 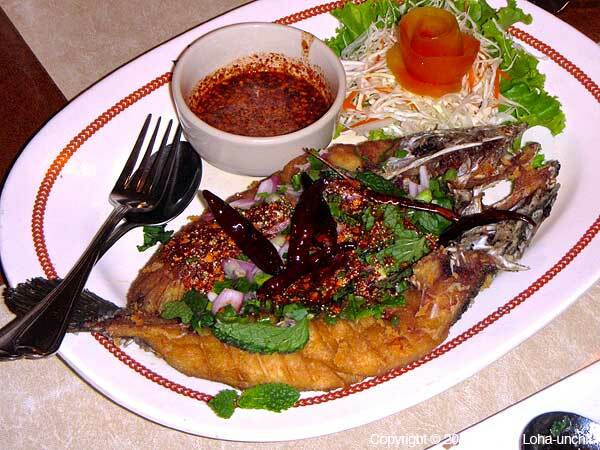 When no moisture remains, oil molecules do not have any place to attach themselves to on the dried-out surface of the fish; as a result, the crisped fish is not heavy, soggy and oily. Fish fried this way does not lose its crispiness soon after it comes out of the oil from juices inside being sweated out, but remains crunchy crispy even after it cools. 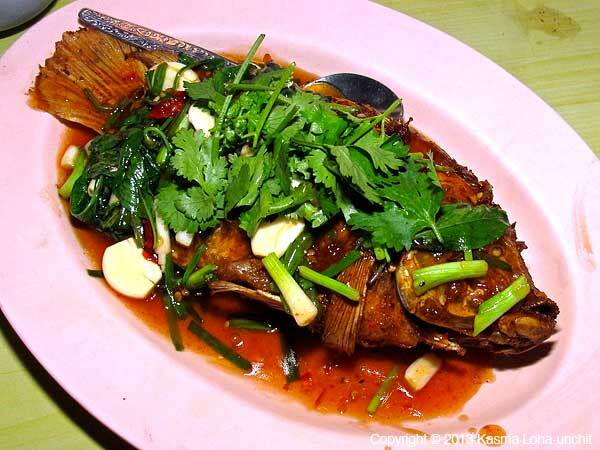 Of course, the kind of oil used for frying the fish is important. It should be one that can be heated to and kept at high temperatures without burning and breaking down, such as peanut oil or palm oil. 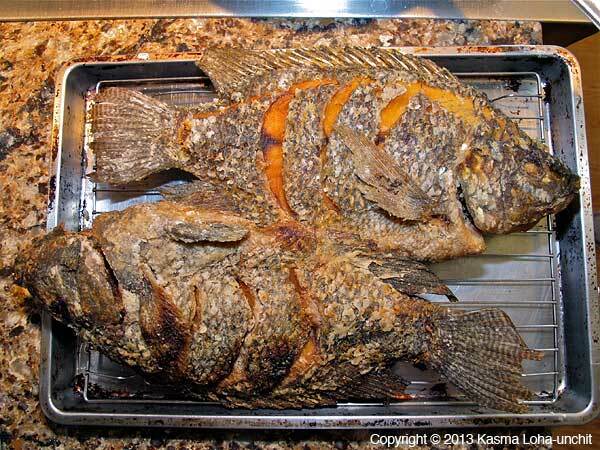 The oil should be heated very hot before adding the fish, so that it sears the outside of the fish and does not penetrate it. This also reduces the likelihood of the fish sticking to the pan and yields cooked meat that is more fluffy rather than dense and compacted. 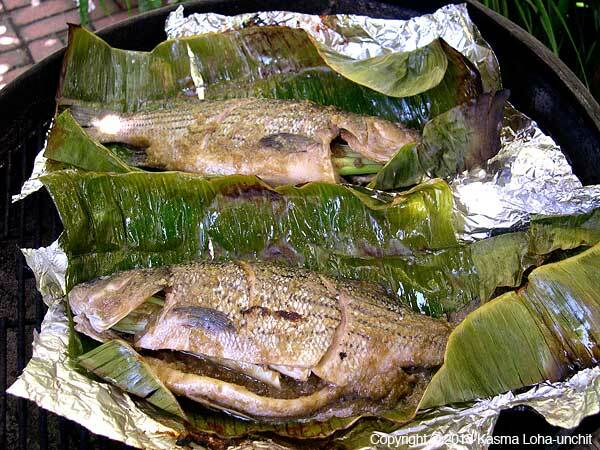 To help the fish cook and crisp faster, make a series of slanted (45°) cuts about one-and-a-half inches apart through the thickness of the flesh to the level of the center bone on both sides of the fish; or score with a diagonal criss-cross pattern. 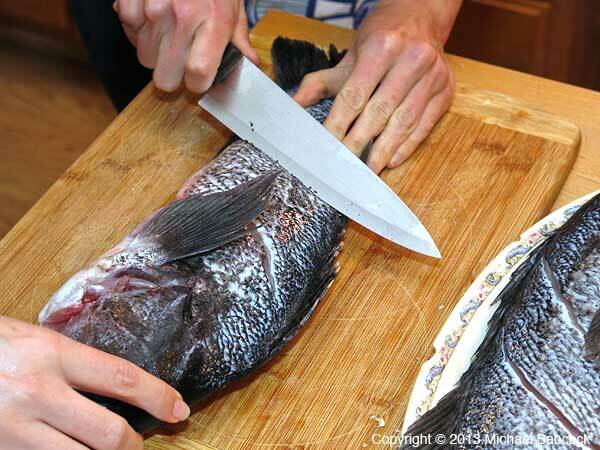 Make the cuts with the knife blade positioned at a 45° angle to the surface of the fish; the flesh overlaps the cuts so that when it shrinks with frying the bone is not exposed, giving a better presentation. 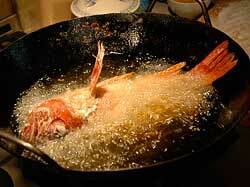 Holding the fish by the tail, gently slide it into the oil, letting go along the side of the wok as close to its surface as possible so that the oil doesn’t splash up on your hand – letting go too soon is more likely to hurt you. If your stove is not a very hot one, the fish can be fried from start to finish over high or medium-high heat. 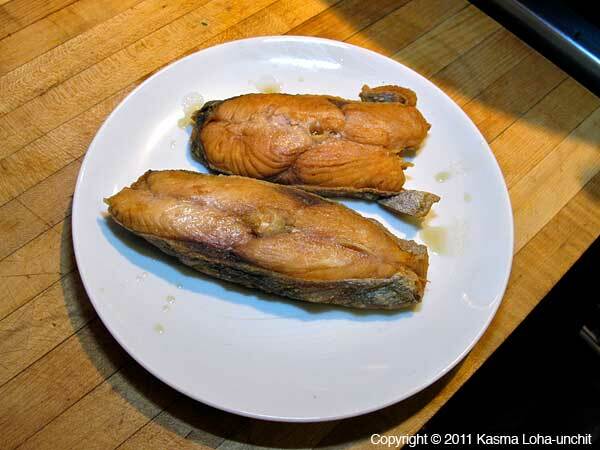 For a very hot stove, reduce and fry at medium heat to keep the surface of the fish from burning before it is cooked and dried through. 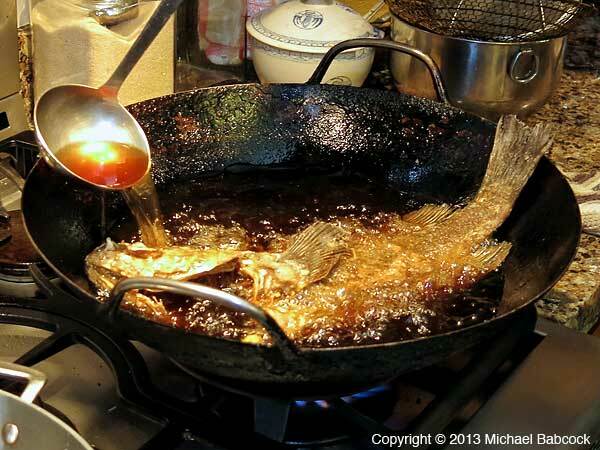 While frying, occasionally tilt the wok from side to side, so that the head and tail get submerged and crisped along with the mid-section of the fish. This is easy to do if the wok is well-balanced on a wok ring; it is even possible to leave the wok tilted on its own in one position for a minute or two before shifting to another position (see Kasma’s blog Adapting the Wok to your Stove). 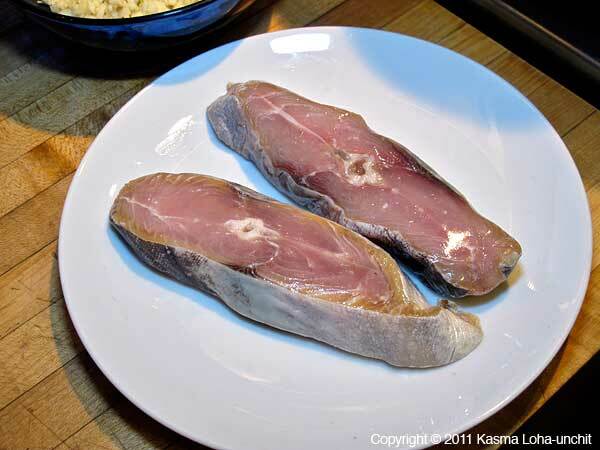 Oil may also be ladled continuously over the fish, which will cut down on the time needed to fry the second side when the fish is turned over. When the first side is well-browned, well-crisped and dried through, nudge the wok spatula under the fish from its top edge and gently roll it over on its belly, taking care not to break any fins. 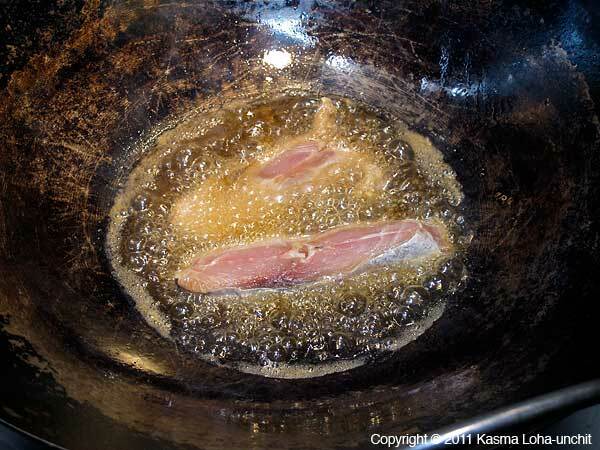 Fry the second side the same way until it is as brown and crispy as the first side. It takes a few minutes less time than the first side. 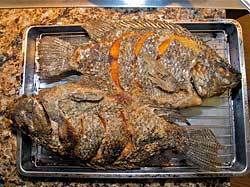 For a one-and-a-half pound whole fish, the first side usually takes twelve minutes to crisp while the second side about eight minutes. 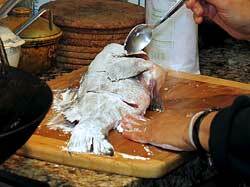 For smaller or flatter fish, like pompano and white perch, less time is required. When the fish is thoroughly crisped, again nudge the wok spatula under it from its top edge. Tilt it up against the side of the wok above the oil for a few seconds to allow the oil to drain from the body cavity. 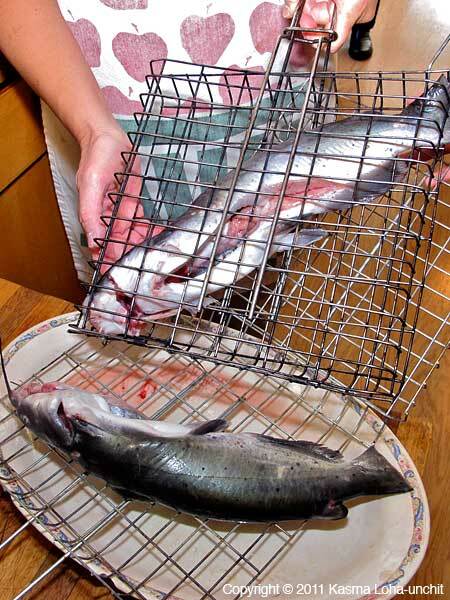 Then lift it out onto a wire rack. 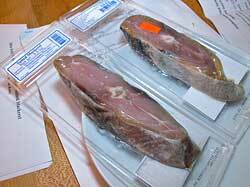 Let drain and cool a few minutes before transferring to a serving platter. 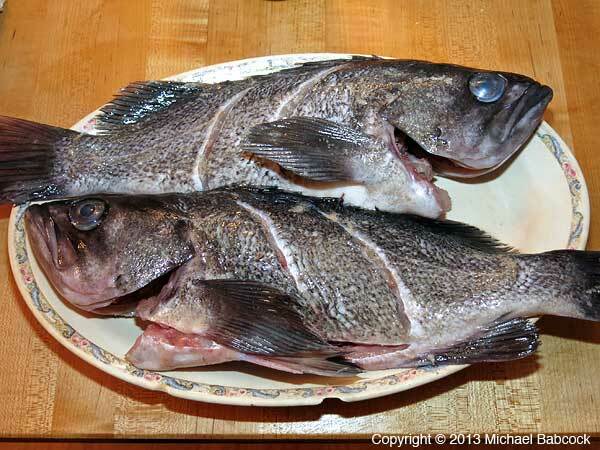 Not all fish should be so thoroughly fried and crisped as described. Use soft- to medium-firm-flesh fish, no larger than two pounds and preferably varieties with thin fins and tails that crisp up nicely for crunching on. 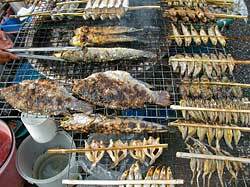 Delicious fried this way are snapper, rock cod, grouper, catfish, pompano, white perch, tongue sole and other small and flat fish. Because of their size, smelts, fresh anchovies and whole sand dabs can be fried completely immersed in oil. 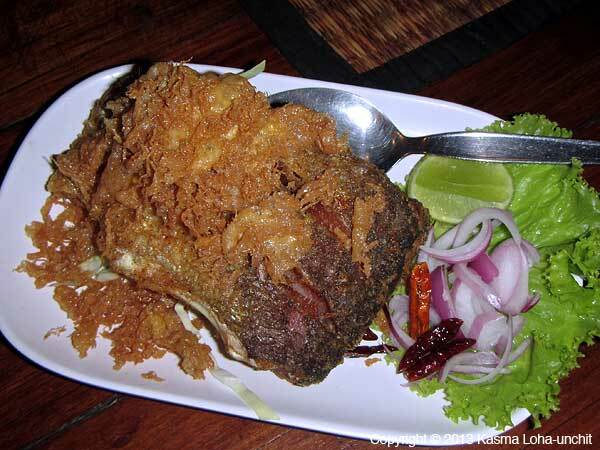 Firm, meaty fish with thick, dense flesh are not good fried so long and should only be lightly crisped to retain some juices – cut down on the frying time by one-third to one-half. 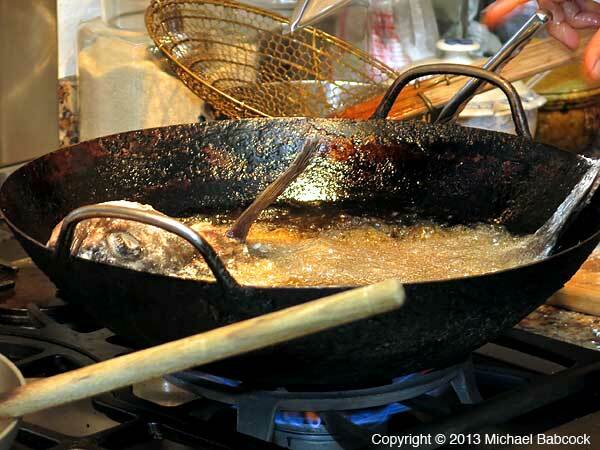 The wok is a very safe utensil to use for deep-frying, so if you are afraid to fry fish in such a large quantity of oil, read the my article Using Your Work. The deliciously crunchy results produced are worth the try. 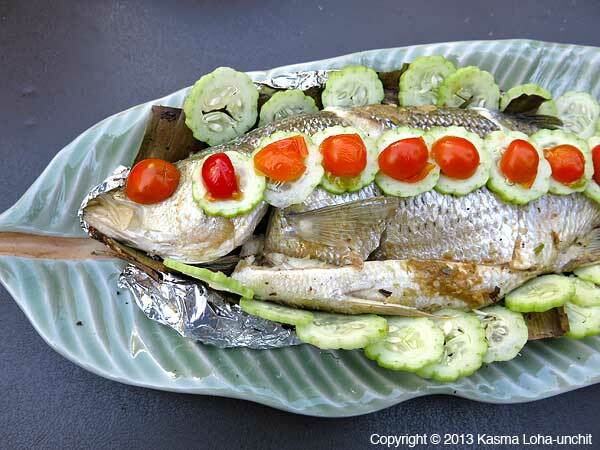 If you’d like to see a slideshow of Kasma making Crispy Fried Whole Fish Topped with Chilli-Tamarind Sauce (Pla Rad Prik) from start to finish, check out Michael’s Blog on Kasma’s Intermediate Class #1. Or, come take Kasma’s Thai cooking classes. 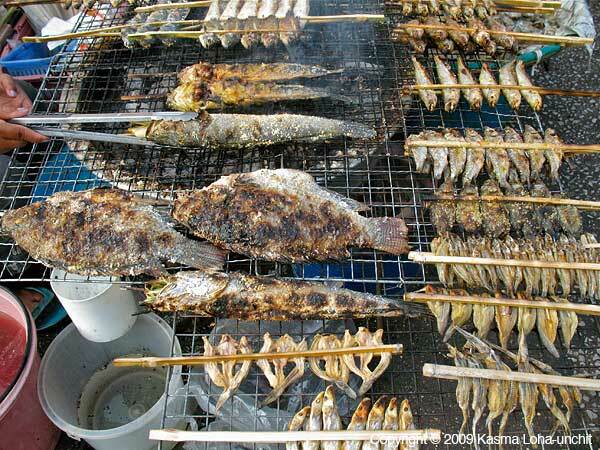 I would hate to estimate how many different fried fishes there are in Thailand. 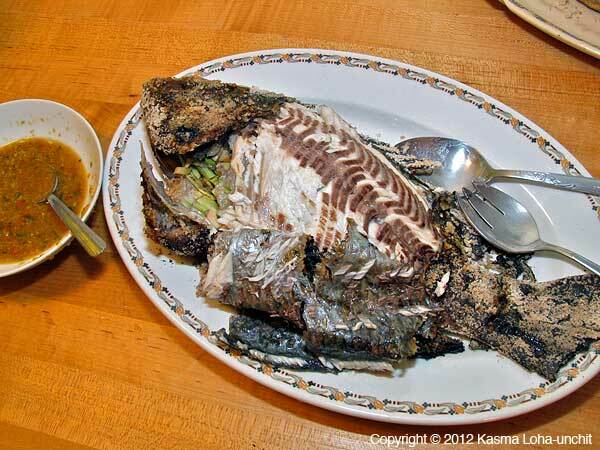 This slide show is limited to a dozen dishes that we’ve come across on trips. It should begin to hint at the variety of delicious dishes that are available. 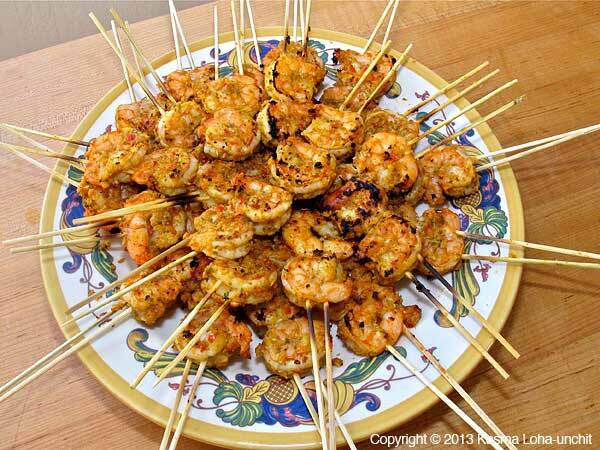 Note: A version of this blog originally appeared on pages 97 & 98 of Dancing Shrimp: Favorite Thai Recipes for Seafood, published in 2000 by Simon & Schuster. All text is Copyright © 2000 & 2013 Kasma Loha-unchit. Today is the first anniversary of my mother’s passing. 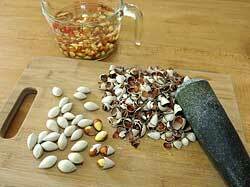 I spent the morning cracking and peeling gingko nuts – a nourishing, medicinal food that mother absolutely loved. During the last several years of her life, she was frail and unable to walk or stand for very long. So every time I went home from across the ocean to visit her, I would bring a big bag of gingko nuts and we would spend precious hours together sitting by the dining table after breakfast cracking and peeling them. 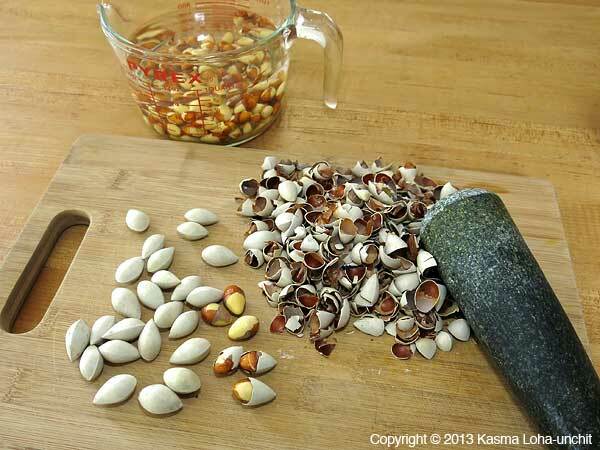 Using a stone pestle, I would gently tap the ridge of the pistachio-sized nuts to crack them and mother would peel off the shell and as much of the paper-thin membrane encasing the kernels as she could. The shelled kernels were then soaked in water to loosen the parts of the membrane that tightly hugged the soft, edible flesh. After the nuts were all cleaned, they were boiled in water sweetened with a little bit of raw sugar or wild honey and that would become her late afternoon snack or a light dessert after a light evening meal. Simply prepared, the nuts retained their delicious flavor and delightful, soft-but-chewy texture. There would be plenty left for many more servings over the course of my visit. Mother always looked forward to her bowl of gingko nuts – they gave her tremendous satisfaction and comfort, while at the same time, nourish her in the evening of her years. Cracking and peeling gingko nuts took time, but what better way to spend countless, precious hours with my elderly mother that I would always treasure. We talked and laughed and told stories, but most of the time, we were just silent, cherishing every moment of just being with one another. This activity was the last food prep and cooking activity I shared with my mother, and whenever I crack and peel gingko nuts, I will always remember the many timeless mornings spent with her preparing one of nature’s great healing foods – as well as all the times in my life that I had spent with her preparing nourishing foods for the family and, in the process, learning from her the secrets of cooking, which I now share with my cooking students. 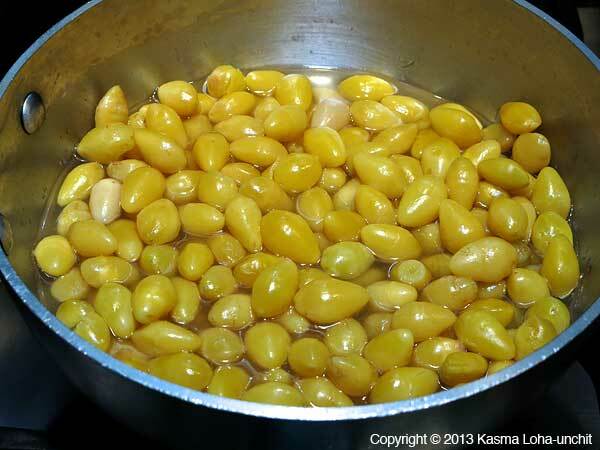 Like my mother, I love both the taste and the texture of fresh gingko nuts. When cooked right, they are soft and chewy, somewhat remiscent of sticky rice. Although the nut has a slightly bitter taste, to her and me and everyone else who loves gingko nuts, it is not unpleasant and is a reminder of its medicinal properties. Technically speaking, gingko nuts are not really nuts but the seeds of the gingko tree (Gingko biloba, commonly known as the maidenhair tree). They bear no resemblance whatsover to other nuts in texture, flavor or nutrition. They taste more like some kind of legume or vegetable. Although many Asian markets in the Bay Area carry refrigerated, vacuum-sealed bags of peeled and cooked gingko nuts, these taste awful and should be avoided. Buy only the whole, unshelled gingko nuts from dried goods stores in Chinatown. They look a lot like pistachio nuts in size, color and form, but are pointy at one end. 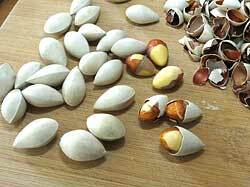 In fact, during her first trip to the United States some forty years ago, mother almost mistook pistachios for gingko nuts. She was very excited to see what she thought were cracked gingko nuts in a supermarket, until she took a closer look. Of course, she quickly learned to love pistachios as well. 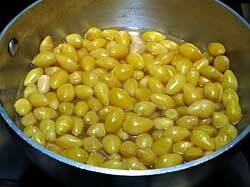 I prefer to buy gingko nuts from bulk bins, rather than already bagged in net bags in some Asian grocery stores. That way I can see the individual nuts more clearly and select ones that are large and white and not broken, discolored, moldy or mildewy on the outside of the shell. When cracked and shelled, the kernels inside should be plump and cream-colored; after they’re cooked, they turn a lovely bright yellow color with a radiant sheen. 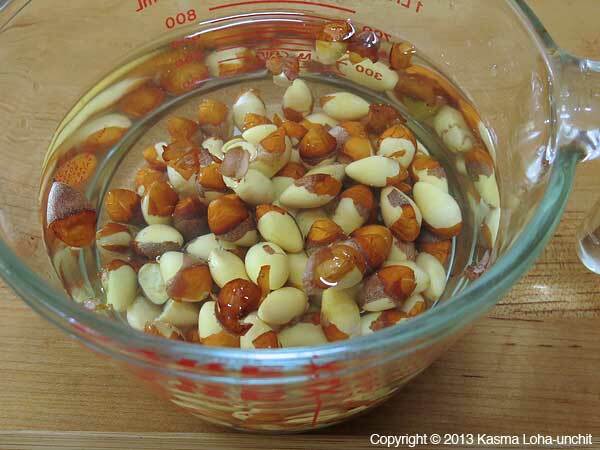 It takes a little work to crack and peel gingko nuts, but it’s well worth the effort and, to those who like to cook and eat healthy foods, this prep work can be a therapeutic activity. Gingko nuts were introduced into Thailand by the Chinese and all gingko nuts sold in the country are imported from China. Thailand is too hot and tropical a country to grow the temperate-climate gingko tree. 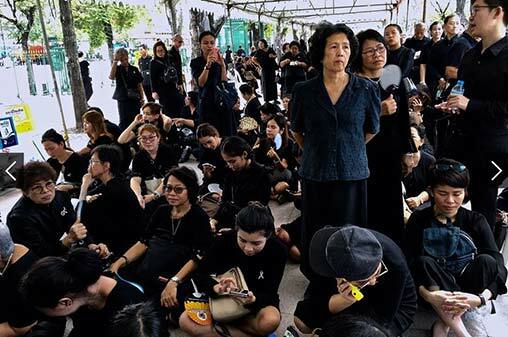 The city of Bangkok, which had its beginnings as a Chinese trading post a few hundred years ago, is said to have the largest Chinese population of any city outside a Chinese country (i.e., China, Taiwan, Singapore). In the Old Market (Talad Kao) of Bangkok’s Chinatown, there are many stores selling gingko nuts, both whole unshelled and peeled and cooked. (See picture, below right.) They are also available in many of the city’s shopping centers and marketplaces which have stores or stalls that carry Chinese goods. Chinese restaurants around the city feature dishes made with gingko nuts, including stews, soups, stir-fries and desserts. Often, gingko nuts are cooked in a rice congee along with chestnuts, lotus seeds, red dates and medicinal roots, bark and herbs. They are not only delicious but very nutritious. 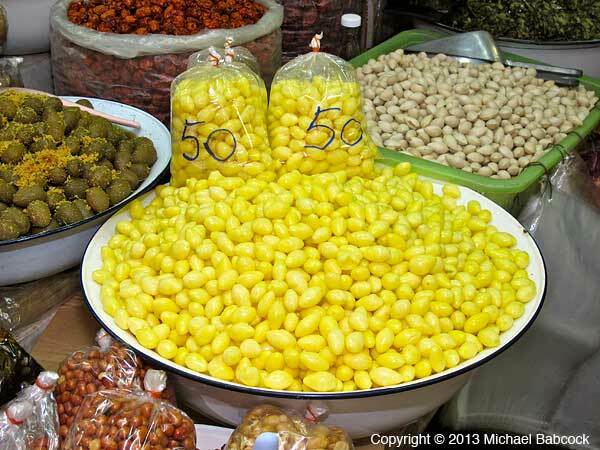 Gingko nuts have made their way into a few Thai sweet snacks and desserts, which are adapted from the Chinese. 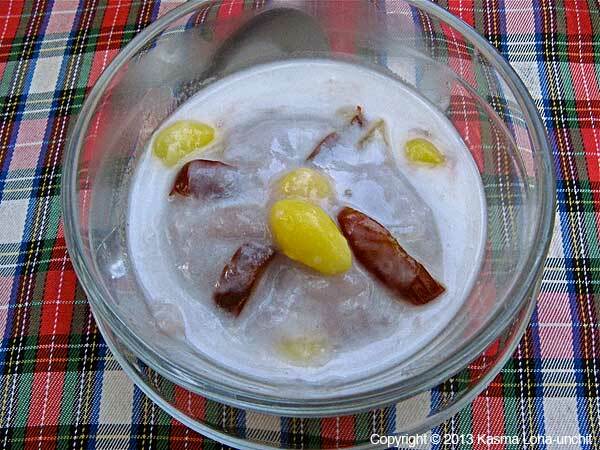 One such dessert, called Oni Pae Guay (using the same Chinese name of a common Chinese dessert), is often on the dessert menu of many large Thai restaurants. 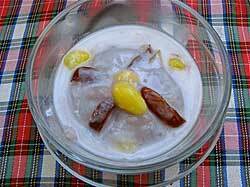 It takes the form of a creamy, smooth and sweet, mashed taro paste (but less sweet than the Chinese version), topped with slices of cooked Chinese red dates and a few gingko nuts, with the added Thai touch of a salty-sweet coconut cream sauce. Another sweet snack is a soupy pudding of job’s tears (another healing food native to most of East and Southeast Asia – a grain reminescent of barley and often called “pearl barley”), accented with gingko nuts and strips of slivered young coconut meat, cooked in young coconut juice flavored with pandan leaves (a medicinal herb in traditional Thai herbal medicine prevalently used to flavor and color many Thai desserts). 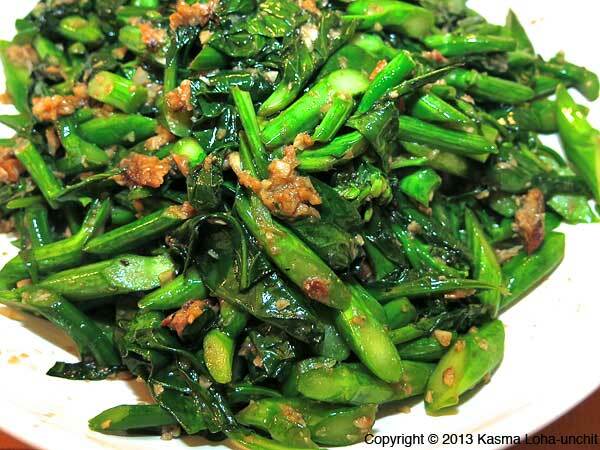 This fusion Thai-Chinese dish is both a delicious and healthy snack/dessert. In tribute to my mother and her love of gingko nuts, I introduced this dessert just a little over a week ago in my new Advanced I evening cooking series to commemorate her passing a year ago this month. 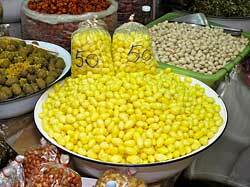 Gingko nuts are a medicinal food in much of the Orient. They are an excellent antioxidant, rich in vitamins, micronutrients and amino acis, and have become known for their anti-aging properties. Other benefits include improving circulation to the coronary artery and the brain, sharpening of the memory and aiding in the treatment of Alzheimer’s disease and cancer. In traditional Chinese medicine, gingko nuts have been used for thousands of years to strengthen the lung and kidney meridians. They are used as a “yang” kidney tonic to increase energy, reduce the frequency of night-time urination and incontinence, relieve bladder irritations, and reduce excess mucus in the urinary tract and excess vaginal discharge. A tea made from boiling the nuts is used to treat lung weakness and congestion, including coughing with an excess of phlegm, wheezing, and asthma. They are also used to treat hearing loss, dermatological disorders and psoriasis. I particularly like this passage in an article on Chinese healing herbs: “Long-term consumption helps nourish yin, maintain youth, fight aging, expand capillaries, improve metabolism, promote ruddy and healthy look, provide extra energy and grant longer and healthier lives.” But there is a caveat: don’t eat the kernels raw and don’t eat too many in one sitting (7 for children and 15 to 20 for adults) as they can have a toxic side effect for some people. Now, whenever I peel gingko nuts, I will always remember my mother, who taught me how to cook, who taught me how food is medicine and the first line of defense against illnesses, and who introduced to me a host of exotic ingredients that I still use today and pass on to my cooking students. Her legacy lives on. 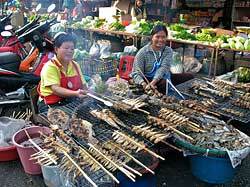 The hot tropical climate of Thailand lends itself to outdoor cooking. 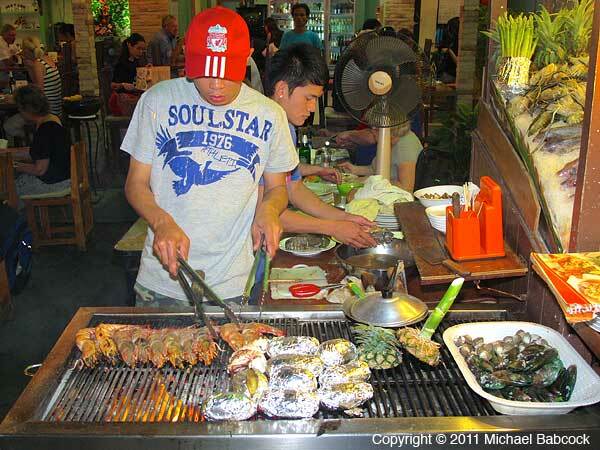 Grilling (in Thai – yang or pow) is one of the methods used in Thai cuisine. 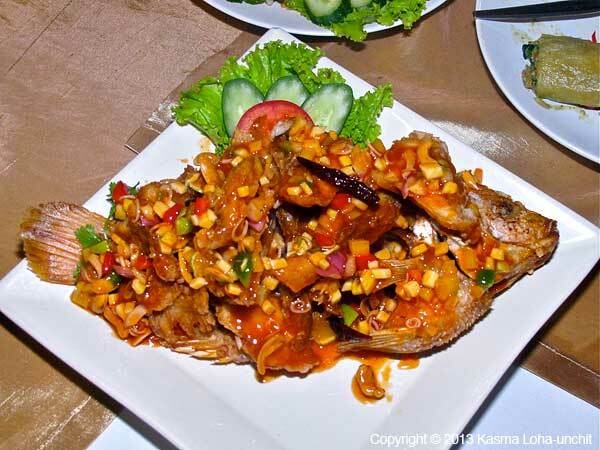 This blog talks a bit about how it is used in cooking seafood (taken from Kasma’s book, Dancing Shrimp: Favorite Thai Recipes for Seafood). With charcoal a main source of cooking fuel until recent times, grilling has emerged as one of the most popular ways of cooking. 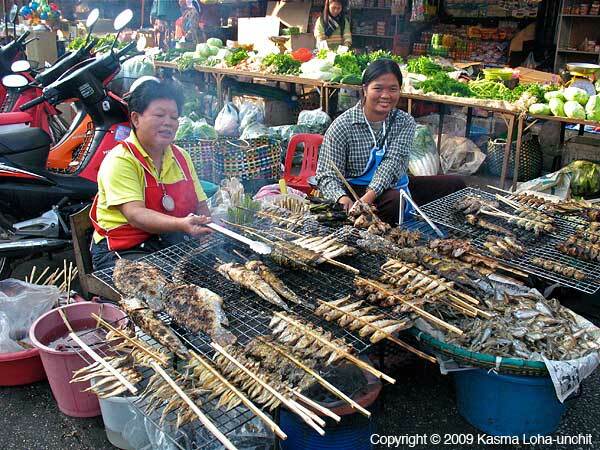 No restaurant is complete without a fired-up grill and no marketplace can exist without a vendor grilling something or another – whether this be catfish on a stick, or skewered meat balls. Along the coast near the capital city, strings of open-air talay pow (“grilled seafood”) restaurants line the beaches, serving up delectable, super-fresh seafood caught the same day. 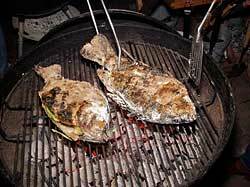 Just about every kind of seafood is tossed on the charcoal grill; some are served simply with a spicy dipping sauce while others find their way into salads, curries and nameless other dishes. 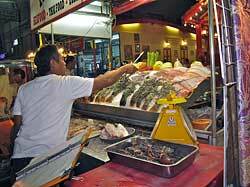 The two pictures above were taken at the night market in the coastal city of Hua Hin. Grilling is always done over real wood coals; sometimes coconut husks and dried palm fronds are thrown in to produce extra smoke, giving the grilled foods a marvelous smoky aroma. 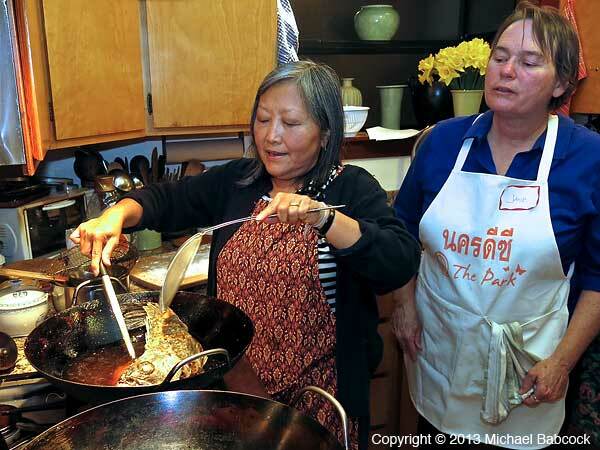 To re-create the delectable flavors of Thai-style grilled foods, a charcoal grill or barbecue kettle is essential, along with long-handled spatulas, tongs and basting brushes as cooking aids. 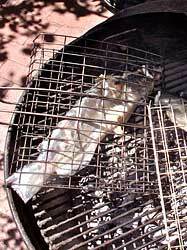 Grilling on a gas grill basically produces similar results as broiling, with a subsequent loss of flavor, unless pieces of charcoal or wood chips are also used. Seafood may be grilled directly on the charcoal grill, or in a wire cage with handle – also called grilling basket or hinged grill. This device comes round, square, rectangular or fish-shaped and comprises of two wire racks hinged together on one side to hold food between them. 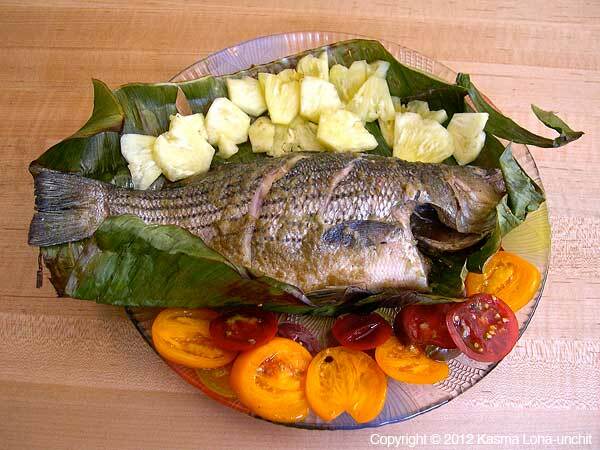 The grilling basket is especially useful for grilling tender whole fish with skin still attached; not only does it make turning easy, it keeps the fragile fish from breaking apart should the skin stick to the charcoal grill. Seafood is also wrapped in banana leaves before placing on the grill. Although the smoky dimension is reduced, the leaves enhance with their own special fragrance, especially if they are lightly charred. 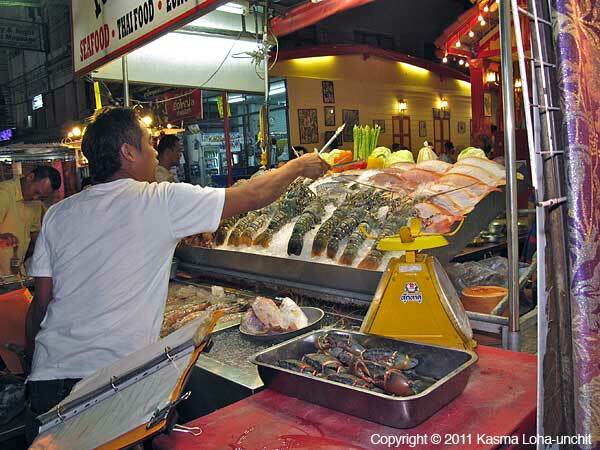 The seafood is usually marinated with spices before being wrapped and essentially gets steamed in its own juices. For a smokier flavor, partially unwrap, or cut an opening on the top of the leaf packet, towards the last few minutes of cooking. 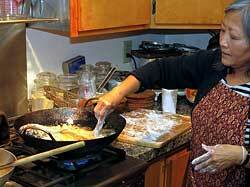 Here are some other articles on different methods used in Thai cooking. Note: This blog originally appeared on page 79 of Dancing Shrimp: Favorite Thai Recipes for Seafood, published in 2000 by Simon & Schuster. All text is Copyright © 2000 Kasma Loha-unchit. 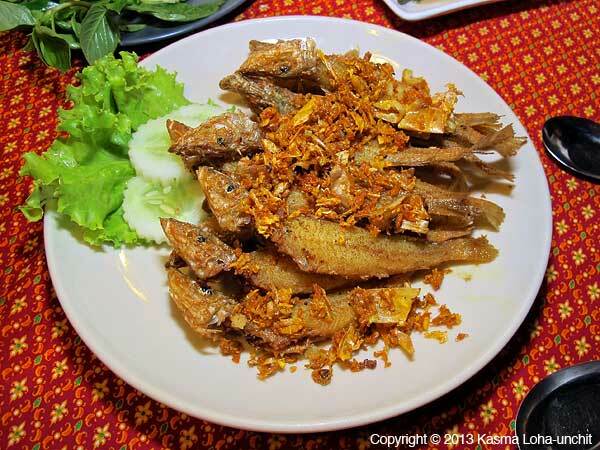 Among highly salted fish, my personal favorite is salted mackerel – pla kem. 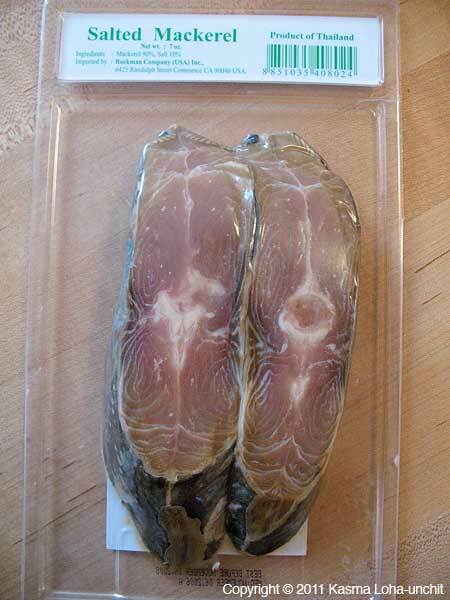 If you like preserved anchovies, you will most likely fall for salted mackerel, too. Look for narrow oval steaks of salted king mackerel either vacuum-packed in plastic and either frozen or in a refrigerator, or stuffed in glass jars covered with oil. Pan-fry in a small amount of oil for a couple of minutes on both sides until well-browned and flaky. 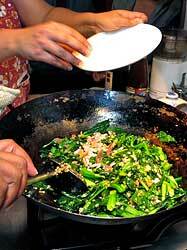 Drain from oil and sprinkle with thinly sliced shallots, thin rounds of Thai chillies and fresh lime juice. 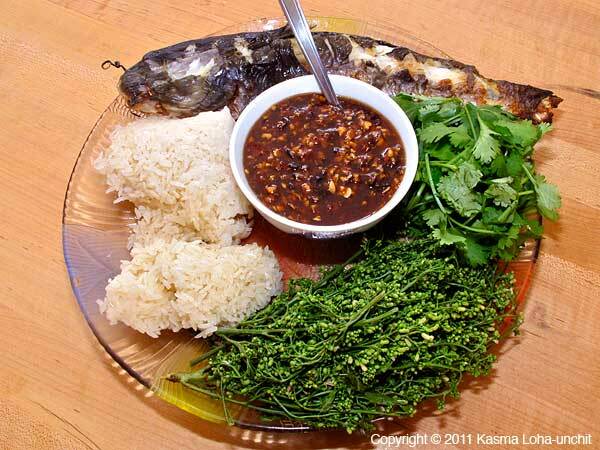 Because it is very salty, only a small bit of the mackerel is mixed and eaten with plain steamed rice. My mother and I share a fondness for salted mackerel and just a tiny piece can help us polish up a big pot of rice, feeling very satisfied! 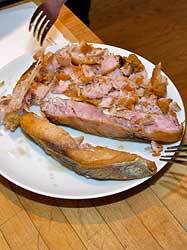 Salted mackerel is also used as a flavoring ingredient, such as in the Chinese steamed chopped pork with salted fish. Use it as you would salted anchovies. 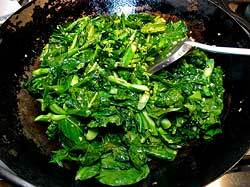 It makes a particularly tasty flavoring for stir-fried Asian broccoli, or broccoli rabe (see recipe below). 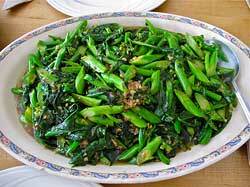 Flake the flesh of pan-fried salted mackerel and toss in with the greens. 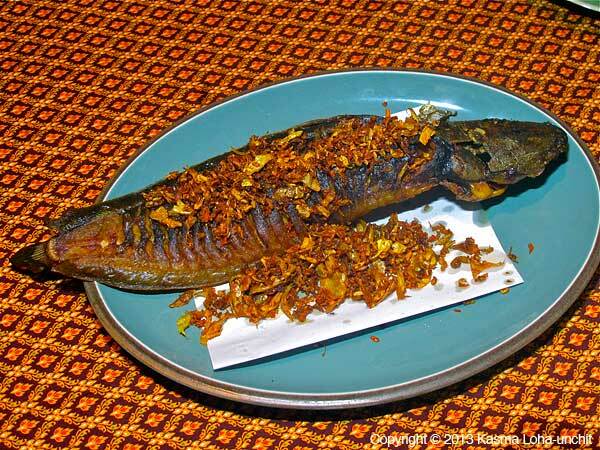 Instead of salted mackerel, small pieces of fried, dried salted mudfish may also be used. 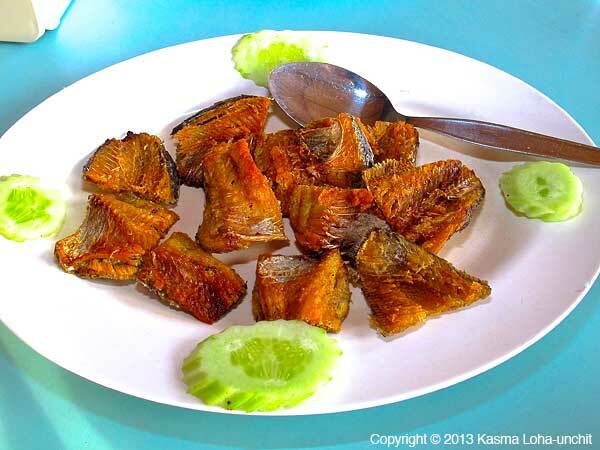 When working with any kind of dried and salted fish, beware of the strong fishy odors likely to be released during cooking, especially frying. 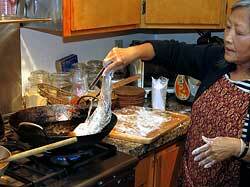 Make sure there is plenty of ventilation in the kitchen to disperse the lingering fumes. 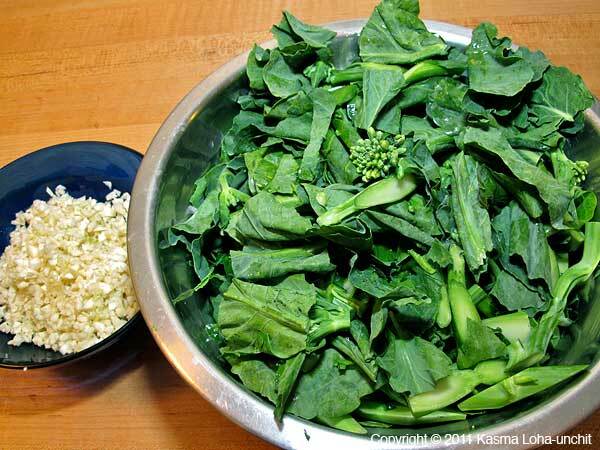 Starting from the stem-end, cut the Asian broccoli at a very sharp slanted angle 1/2 inch apart to make pieces about 1 1/2 inches long. Peel the bottom of the larger, more fibrous stems before cutting. For pieces with leaves attached, cut the leaves into 2-inch segments. Do not make it a point to detach the leaves from the stems; there should be pieces of stem with some leaf attached. Keep the pieces from the bottom half of the stems separate from the more leafy upper half. Heat 2 tablespoons of oil in a wok over medium-high heat until it begins to smoke. Fry the salted mackerel in the oil for 2-3 minutes on each side until well-browned. 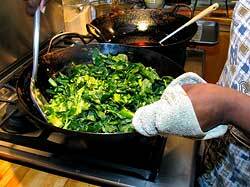 Remove from wok. Increase heat to high and swirl in the remaining oil. When it is smoking hot, add the chopped garlic, stir for 10-15 seconds, then toss in the bottom stem pieces. 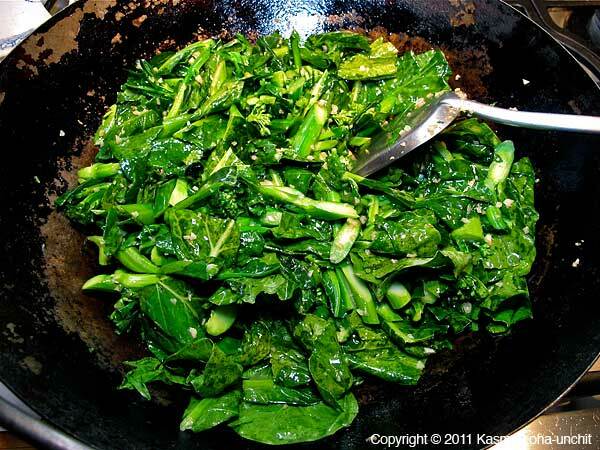 Stir-fry half to one minute before adding the leafy pieces. Continue to stir-fry until the leaves have mostly wilted. Sprinkle with oyster sauce and 1 tsp. of fish sauce, stir and mix well. Break the mackerel into small chunks and toss in with the vegetable. Stir-fry a little while longer until the broccoli is tender, but still crisp, and a vibrant green color. 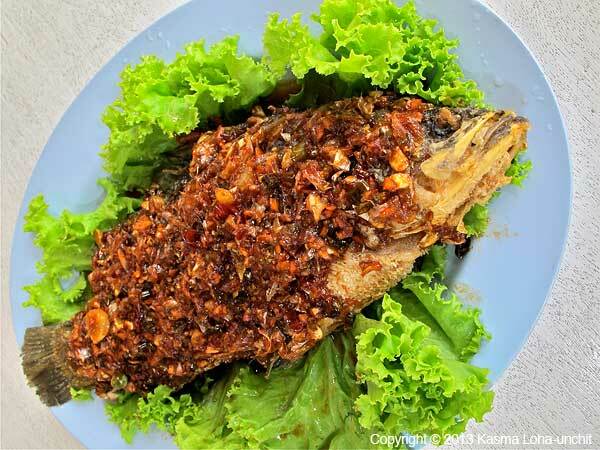 Taste and add more fish sauce as needed to the desired saltiness. Stir well and transfer to a serving dish. Serves 6 with rice and other dishes in a shared family-style meal. 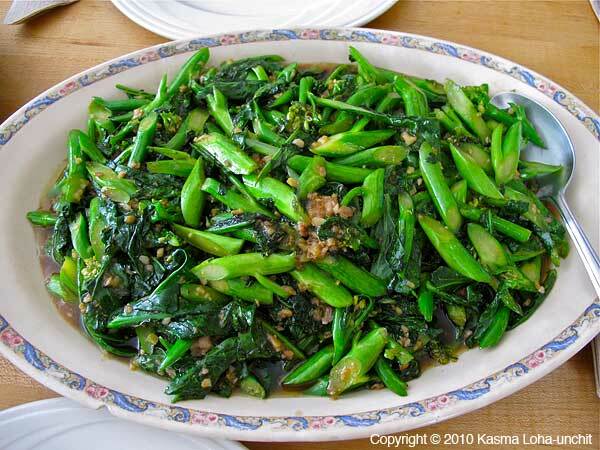 A very nutritious bitter green vegetable readily available from most Oriental produce markets, Asian or Chinese broccoli has insignificant flower buds and is prized for its deep green leaves and firm, crisp stems. Select a bunch with small tender stems. If the stems are large, the bottom half may need to be peeled to remove the tough fibers. Cutting the stems at a very sharp slanted angle helps break up the fibers that run the length of the stalks, giving them a more tender texture. The sauce can also penetrate the vegetable better through the longer cut that exposes the interior of the stems. 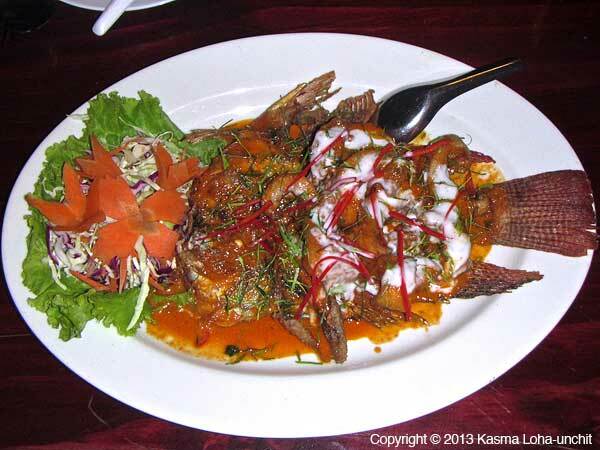 Note: This blog originally appeared on pages 42 to 43 of Dancing Shrimp: Favorite Thai Recipes for Seafood, published in 2000 by Simon & Schuster. 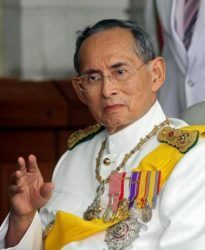 All text is Copyright © 2000 Kasma Loha-unchit.